Jerry Anton Matysek, 85 passed away Thursday May 10, 2018, after a lengthy battle with emphysema and heart failure. Jerry was born in Thalia, Texas to Lillian Halencak and Charlie Matysek both of whom preceded him in death as well as two brothers, Alfred and Jeff. After a short period on the professional rodeo circuit, he worked as a cowboy on the famous Waggoner Ranch. A veteran of the US Navy, he served in Sea and Air Rescue during the Korean War. Jerry was married to Joanne Berry of Vernon, Texas for 64 years. Jerry was an over the road truck driver, working for Red Ball Motor Freight for 18 years, finishing his career with System 99 Freight. He drove over 2 million accident free miles, earning him the Million Miler patch and was a proud member of the Teamsters Union. He worked for the City of Irving Street Department after his driving days where over, retiring in 1991. The couple loved travel, especially in their motorhome, and Jerry managed to visit all 50 states. He was a fifty-four year resident of Irving, Texas. 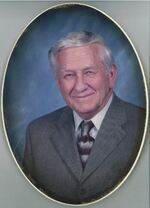 Jerry is survived by his wife Joanne; son Bill Matysek and wife Cheryl of Grand Prairie; daughters Connie Matysek Diaz of Spokane, Washington and Laura Matysek Wood of Fort Worth, Texas; two grandchildren, Marne of Rochester, Minnesota and Matthias Matysek of Grand Prairie, Texas; and brother Charlie Joe Matysek of Vernon, Texas. A committal with Military Honors will be held at 9:15 am, on Friday, May 25, 2018 at Dallas Fort Worth National Cemetery, 2000 Mountain Creek Pkwy in Dallas. 15 minutes prior to the service, friends and family attending, will begin the processional line up at Lane 2. To send flowers to the family of Jerry Matysek, please visit our Heartfelt Sympathies Store.